The iPhone 6s and 6s Plus include several new camera features that have been highly popular in reviews thus far, but there's also a fantastic update to the way photos are displayed on the two devices. With Live Photos, exclusive to the iPhone 6s and 6s Plus, a bit of motion is captured alongside each photo, enabling short animations that bring each image to life. 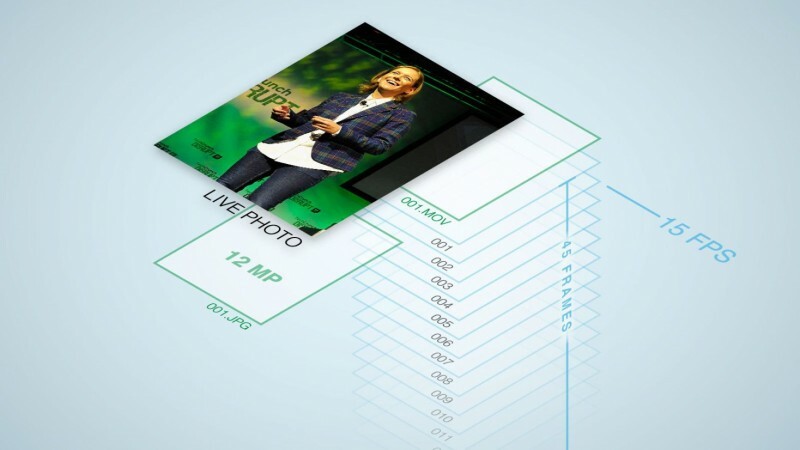 To enable Live Photos, the iPhone captures 1.5 seconds before every picture is taken and 1.5 seconds afterwards. The motion is then displayed whenever a 3D Touch force press is used on a photo, activating the animation to add a bit of context. With iPhone 6s reviews coming out today, we've learned several interesting details about the Live Photos feature, including some negative aspects that Apple's working to improve. We're also able to get an in-depth look at what the reviewers thought of the feature, giving us an idea of whether it's truly useful or more of a gimmick. Apple has been quick to point out that a Live Photo is not a video, and it appears the feature is enabled by combining a 12-megapixel JPG with a MOV file. TechCrunch's Matthew Panzarino reports (in his full review of the new iPhones) that a Live Photo consists of a JPG combined with a MOV file that contains 45 frames playing back at around 15 frames per second. Combining a JPG with a MOV file means Live Photos take up twice the space of a normal image. Panzarino also shared some tips on getting good Live Photos shots, but said he believes the best use cases are still undiscovered. In my experience, Live Photos work best when capturing ambience, not action. Because the frame rate is relatively low, moving the camera a ton while you shoot them or having a subject move will display a bit of jitter. If, however, you're shooting a still image with some moving elements, the effect is extraordinary. According to The New York Times' Brian X. Chen, there's a "short learning curve" for Live Photos, because moving a camera immediately after taking a photo will ruin the Live Photo, something Apple says it will fix in an upcoming software update. There's also no way to remove audio, and editing a Live Photo only applies edits to the still frame. Two other items that I'd like to see addressed in future software updates: One, when Live Photos are captured, they include audio. I'd like the option to disable that because images alone can speak loudly enough. You also can't edit Live Photos. You can only apply an edit to the still frame, but not the motion frames. It would be ideal to at least be able to make minor adjustments to Live Photos, like increasing brightness or contrast. The Wall Street Journal's Joanna Stern calls Live Photos "the phone's best new feature," in her review, and shares a selection of example images that give a good look at how Live Photos look. Because of the way Live Photos work, combining a MOV file with a JPG file, the full Live Photo experience will only be viewable on iOS devices that run iOS 9, the Apple Watch with watchOS 2, and Macs running OS X El Capitan. Sending a Live Photo by email or directly to non-supported devices, the Live Photo will be stripped of the MOV component and sent as a regular JPG. However, when importing Live Photos to your Mac in Yosemite's Photos app, they're imported as a separate JPG and MOV file. When TechCrunch's Matthew Panzarino sent a Live Photo to our iPhone 6 running iOS 9, the Live Photo was viewable (with motion) in iOS 9. When imported into Yosemite's Photos, the image was split into the JPG and MOV components. 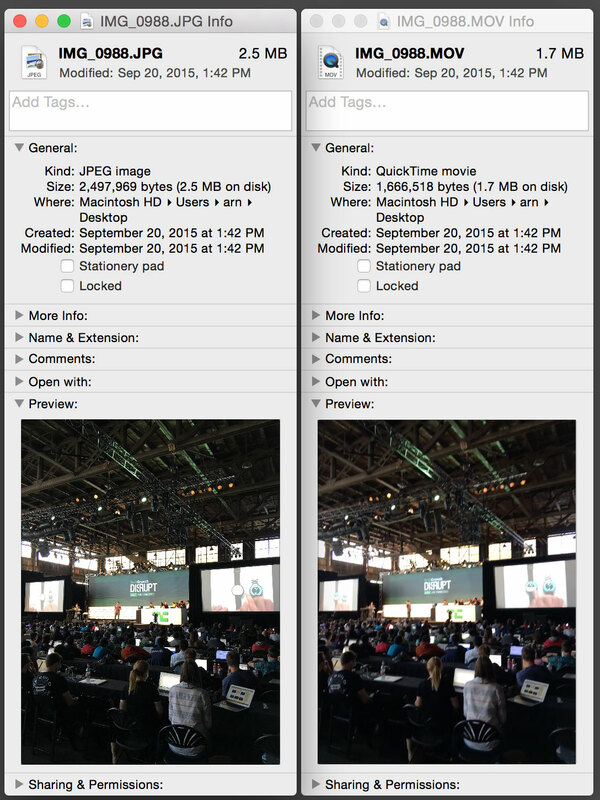 Importing into Photos on OS X El Capitan generates a single photo in the library, and double clicking it plays the video portion of the Live Photo. As you can see, the JPG and MOV components took up 2.5MB and 1.7MB of space, respectively, for this Live Photo taken with the iPhone 6s back camera. Meanwhile, the front camera took a lower resolution 1MB image, but with the same size 1.7MB MOV file. The MOV resolution was 960x720 at ~12FPS for both sample Live Photos. We'll learn a lot more about Live Photos this Friday, when the iPhone 6s and 6s Plus become available to the public. 3D Touch, 12MP 4k camera, and 2GB of ram are all better features. That is going to be incredibly confusing for the general consumer. No it won't. Most consumers don't care how the files are stored. They just know that they'll work on Mac/iOS devices, and not other devices. Simple. Android has this for years. Yeah, that's a classic Apple move -- take something Android or whoever has been doing badly for a while and do it much, much better. See also: Touch ID. I assume they're using standard video compression for the additional frames (since it is just an MOV), which means that the frames are made up from the sum of the parts, rather than each frame being it's own independent image. Apple outbid Hooli for Pied Piper and are using Richard's compression algorithm. If by saying "rebranding" you mean "making much easier to do and allowing million of people to not have to be super geeks to just enjoy the simple things in life" then yes....yes they did. You forgot to add "and also making them contain a high resolution photo and short movie with audio that is nothing like a .gif"
So Apple has just rebranded gif animations.